Most travellers to Groningen book a flight to Amsterdam (AMS). There is a railway station at the airport, where you can take a direct train to Groningen. The ride to Groningen Central takes about 2 hours. You can plan your journey and buy tickets here. For some flying directly to Groningen-Eelde Airport might be convenient. There are direct and daily flights from London Southend and Copenhagen. 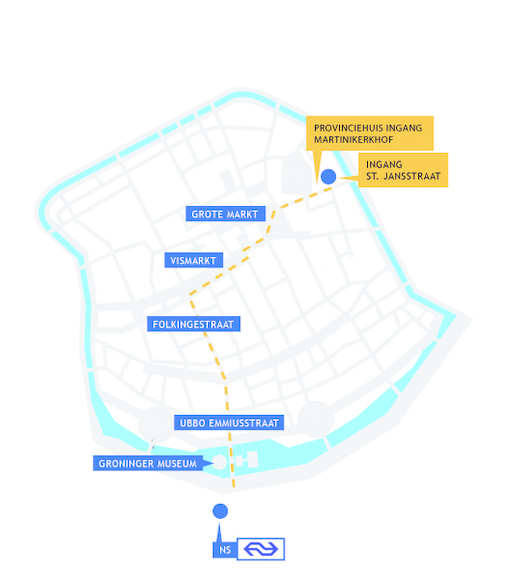 From Groningen Central it takes 15 minutes to reach the venue by foot. See the map below. From the Grote Markt you walk in 3 minutes to the Provinciehuis. You have to go to the entrance at the Sint Jansstraat number 4.